Is Haven Doniford Bay Dog Friendly? We have just returned from a short break at Haven Doniford Bay Caravan Park in Somerset. When I was looking for a short break this Summer, knowing it would only be a short break, we found plenty of great dog friendly Haven holidays. After having a great holiday in Disney World earlier in the year, I was determined to be able to take Lola on holiday with us as well. I spent quite a bit of time researching different dog friendly holidays from cottages to caravan parks that allow dogs, and even camping. When costing everything together, a Haven holiday park didn’t come out too much more expensive to camping considering we would have had to buy all the equipment as well. Are dogs allowed in Haven caravans? When booking a Haven holiday, the majority of the parks allow dogs in selected dog friendly caravans. Are dogs allowed on Doniford Beach? The area of Doniford Bay in Watchet was one of the main reasons we booked in the end as Doniford beach is right on the edge of one of Haven’s dog friendly holiday parks. Dogs are welcome on the beach all year round. There are lots of little details you look out for as a dog owner when attempting to go out for days or holidays with your dogs, and being able to provide space for them is one of the biggest factors we have found. We booked our break at Doniford Bay holiday park knowing that we were getting the most basic accommodation the park offers as we were taking Lola with us. I wasn’t expecting luxury but as long as it was clean then we should all get along fine. The main question we had was is Haven Doniford Bay dog friendly? I had done a fair bit of research on Trip Advisor and You Tube and the signs were looking good so we were all looking forward to the break. When we arrived and were allocated our van, we were pleased to see it was close to the entrance to the beach and also close to the dog walking area. I thought perhaps it would be a small section of grass, but it was a huge area with a mix of grass and shingle. First impressions were good, and there were plenty of dog bins around with hardly any mess spotted through our stay which was also good. We never let her off the lead on the grassy dog walk area as it was too open and she was so intrigued by all of the different smells that she doesn’t get at home, however she had plenty of space to run free on the beach as the tide went out for miles and there was hardly ever many people around. On the site itself, we often took Lola with us when we were on our way to activities such as archery that Miss A took part in. There was so many grassy areas that we were able to sit with Lola on her lead and watch Miss A at the same time. We could also watch her in the park, on the climbing wall and in fact all of the outdoor activities, so no-one missed out on anything which was nice. We didn’t meet too many other dogs around the park, but they were there as we bumped into them now and again. We were also blessed with very good weather and had we chosen to, we could have sat on the restaurant decking area with Lola as we enjoyed a meal from the restaurant. I liked that idea as it meant we truly could all be together enjoying our holiday. We were very impressed with how welcomed dogs are at Doniford Bay, and I know Lola definitely had a great holiday. I don’t think she knew what to do with herself when we arrived and her senses went into overdrive. It took her a few days to really calm down when we popped out for a quick walk with her. She’s never had so many walks in one day before. We were allocated a very basic dog friendly caravan, which you can see in the video below, and it was obvious from looking at our neighbouring caravans how basic ours was, but it was a choice we made when choosing to get a dog and include her in our family holidays. It provided us a good base for the week and I can happily answer the question of Is Haven Doniford Bay Dog Friendly? The answer is most definitely yes! If you’re looking to spend some days exploring things to do near Doniford Bay with your dog, then why not take a short 15 minute drive to Dunster Castle, a National Trust property on the edge of Exmoor. Dogs are welcome in the Castle gardens, stable and shop when kept on a lead. You could also venture out to the West Somerset Railway where dogs are welcome to travel with you. 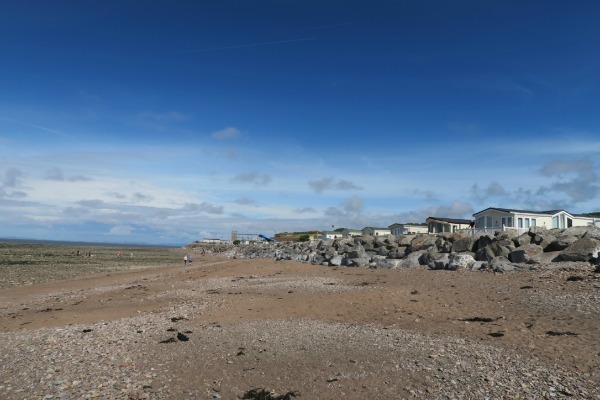 Alternatively if you’re looking for a different beach to Doniford Bay beach, then dogs are also welcome on Berrow and Brian beaches as well as Kilve beach which is a rock and pebble beach.